A most important recent religious trend that takes us into the heart of authentic, mystical Christianity is the widespread renewal of its contemplative aspect. Lest the reader be confused, be aware that what is generally called "meditation" in other traditions is termed "contemplation" in Christianity, whereas the Christian tradition has reserved the term "meditation" for that more discursive, reflective mental activity which is preliminary or supplementary to contemplation pure and simple. This trend of deeply immersive, silent contemplation has been promoted by Christianity's encounter with Hindu Vedânta and Buddhist schools along with the re-discovery of contemplative spiritual masters in Western Christianity, beginning with the illustrious Desert Fathers and Mothers of the 4th to 7th century in hermitages and cenobitic communities of Egypt, Palestine and Syria. Most influential in this revival of contemplation have been contemporary writers and teachers in Vedânta-influenced Christianity—mainly Benedictine Catholic figures— including Swami Abhishiktananda (Dom Henri Le Saux, OSB 1910-73), Fr. Bede Griffiths, OSB (1906-93), Sister Pascaline Coff, OSB, Fr. John Main, OSB (d.1982), Fr. Anthony de Mello, SJ (India, 1931-87), and Sister Vandana (b. in India in 1924); along with Zen Buddhist-influenced Christians like Benedictine monk Aelred Graham (c.1907-84), Trappist monk Thomas Merton (1915-68), Jesuit priest William Johnston (b.1925), and Zen roshis (authorized Zen masters) Hugo Enomiya-Lassalle, SJ (1898-1991), Sister Joan Rieck (b.1936), and former priest Ruben Habito (b.1947); and Christians who have plunged into the purely Christian contemplative tradition, like the Anglican nun, Mother Mary Clare, SLG, the American Cistercian monk, Thomas Keating (b.1923), the British Benedictine, Basil Pennington (1931-2005), and college professor Fr. Henri Nouwen (1932-96). Tutelage from eminent past Christian spiritual masters is now also widely available in book form. The “Classics of Western Spirituality” series published by the Paulist Press is especially notable and praiseworthy here. The fruit of all this exploration is that many Christians today—especially Catholics, Anglicans/Episcopalians, Eastern Orthodox and Quakers— are experimenting with diverse forms of sublime prayerfulness, not just “saying prayers.” Contemplative prayer can be engaged throughout the day, not just in Church on Sundays. Certain forms of contemplative prayer can be engaged while eating, driving, exercising, working, and so on. The late Mother Teresa’s case is instructive: beyond the four hours each day of formal contemplation, she and her Missionaries of Charity would pray as often as possible throughout their daily round of labors for the needy. Contemplatives sincerely heed the injunction of Jesus to “pray always” (Luke 18:1). Contemplative prayer can take a simple devotional form, à la the “practice of the presence of God,” as recommended by the humble French monk, Brother Lawrence (d.1691). It can manifest as a consistent childlike gratefulness—the attitude of gratitude that Benedictine Brother David Steindl-Rast has so eloquently recommended. It can involve subvocal recitation of a Christian mantra, for instance, the “Jesus Prayer” (“Lord Jesus Christ have mercy on me” or simply the name “Jesus”/“Yeshua”/ “Isa”) as taught by the Greek prayer masters of old, or the phrase “Mara Natha” (“Come Lord”) as taught more recently by British Benedictine Fathers John Main (d.1982) and Laurence Freeman in their influential circle in Montreal. Or contemplation can begin with the deeply sensitive stillness, hesychia, and unattachment as practiced in the ancient Christian “Desert” tradition and in Zen-influenced Christian zazen meditation today. Whatever the initial method, prayerfulness leads one to the stupendous silence and stillness of Spirit, finally culminating in the transpersonal depths of the “Godhead beyond God” reported by Meister Eckhart, Jan van Ruusbroec, Teresa de Ávila, Juan de la Cruz, Abhishiktananda, Johnston, and numerous others. This formless but unspeakably empowering “rapture” or “ecstasy / instasy” is an absorption in what John of the Cross called the “Nada” or Divine No-thingness of pure Spirit. It is fairly identical, if not completely identical, to the formless, nondual Divine absorption that the Vedânta adepts call nirvikalpa samâdhi (culminating in the eyes-open, “natural” state of perfect God-realization, sahaja samâdhi) and the deepest jhâna absorption states practiced by Buddhist meditators (which, when balanced with wisdom, culminate in nirvâna or what Zen Buddhist roshis call anuttara-samyak-sambodhi, unexcelled, irreversible enlightenment). "Enlightened persons find within themselves an essential act of gazing inward which is above reason and apart from reason; they also find an inclination toward blissful enjoyment which transcends all particular forms and beings and which immerses them in a modeless abyss of fathomless beatitude.... There the state of beatitude is so simple and so modeless that in it every essential act of gazing, every inclination, and every distinction of creatures pass away, for all exalted spirits melt away and come to nought by reason of the blissful enjoyment they experience in God’s essential being, which is the superessential being of all beings. There they fall away from themselves and become lost in a state of unknowing which has no ground. There all light is turned into darkness and the three Persons [of the Trinity] give way before the essential Unity, where without distinction they enjoy essential bliss.... All loving spirits are one enjoyment and one beatitude with God, without difference, for that blessed state of being which is the enjoyment of God and of all his beloved is so simple and undifferentiated that there is within it neither Father nor Son nor Holy Spirit as regards the distinction of Persons, nor is there any creature either. Rather, all enlightened spirits are there raised above themselves into a modeless state of blissful enjoyment.... There all exalted spirits are, in their superessential being, one enjoyment and one beatitude with God, without difference.... This is what Christ desired when he prayed to his heavenly Father that all his beloved might be made perfectly one, even as he is one with the Father in blissful enjoyment.... Christ’s prayer is fulfilled in those who are united with God ... they are drunk with love and [consciously] sleep in God in a dark resplendence." "We will be in a better position both to examine the religious experience of the East and to represent our own tradition if we can first rediscover the forgotten richness of contemplative Christianity. The transcendent as well as the immanent dimensions of Christ must be recovered from ancient and medieval Christian tradition.... The tradition of Christian spirituality and mystical wisdom needs to be presented today as an integral part of the proclamation of the Gospel and of Christian education.... Christians are meant to be the continuing revelation of God’s Son through the inspiration of his Holy Spirit who dwells within us. That inspiration can be more or less. It will be more in the degree that we penetrate the mystery of Christ to its depths. This can only be done through contemplative prayer and the abiding state of mystical union to which it leads." 1. 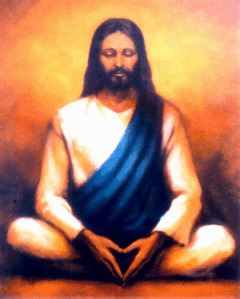 In addition to the important works of Abhishiktananda, see some of the works of other Christian contemplative masters such as: John Main, Word into Silence, Paulist, 1981; Letters from the Heart, NY: Crossroad, 1982; Moment of Christ, Crossroad, 1984; The Present Christ: Further Steps in Meditation, Crossroad, 1986; and Monastic Studies (1984) 15 (special issue devoted to John Main). Anthony de Mello, Sadhana: A Way to God, Doubleday Image, 1984; Awareness: A de Mello Spirituality Conference in His Own Words (J. Francis Stroud, Ed. ), Doubleday, 1990; “An Eastern Christian Speaks of Prayer,” reproduced in Carlos Valles, Mastering Sadhana: On Retreat with Anthony de Mello, Doubleday Image, 1988; The Way to Love: The Last Meditations of Anthony de Mello, Doubleday Image ed., 1995. Thomas Merton, New Seeds of Contemplation, Norfolk, CT: James Laughlin, 1961. William Johnston, Silent Music: The Science of Meditation, Fordham Univ. Press, 1997, Letters to Contemplatives, Maryknoll, NY: Orbis, 1970, and Christian Zen (1974), The Inner Eye of Love (1970), The Mirror Mind (1981), all published by Harper & Row. Aelred Graham, Zen Catholicism. Mother Mary Clare, Learning to Pray, Silence and Prayer, etc., available from the Sisters of the Love of God, Convent of the Incarnation, Fairacres, Oxford OX4 1TB, UK. David Steindl-Rast, A Listening Heart: The Art of Contemplative Living, NY: Crossroad, 1996; Thomas Keating, Open Mind, Open Heart: The Contemplative Dimension of the Gospel, Amity, NY: Amity House, 1986; The Heart of the World: A Spiritual Catechism: An Introduction to Contemplative Christianity, Crossroad ed., 1989; Intimacy with God, Crossroad, 1994 (and many more). Basil Pennington, Centering Prayer, Doubleday, 1979; etc. 2. There are numerous translations of Brother Lawrence’s classic work; see, for example, the fairly recent version by Donald Demaray, The Practice of the Presence of God, Alba House, 1997. See a classic by Brother David Steindl, Gratefulness, the Heart of Prayer: An Approach to Life in Fullness, NY: Paulist, 1984. 3. Meister Eckhart’s works abound in numerous English editions; see, for example, M. Walshe, Meister Eckhart: German Sermons and Treatises (3 vols. ), London: Element, 1979-1985; Oliver Davies (Trans. ), Meister Eckhart: Selected Writings, London: Penguin, 1994; Edmund Colledge & Bernard McGinn (Trans. ), Meister Eckhart: The Essential Sermons, Commentaries, Treatises, and Defense; Paulist, 1981; B. McGinn, et al., Meister Eckhart: Teacher and Preacher, Paulist, 1986; Raymond Blakney (Trans. ), Meister Eckhart, Harper & Row, 1941. On the illustrious Carmelite mystics, see Kieran Kavanaugh & Otilio Rodriguez, The Collected Works of St Teresa of Avila, (3 vols. ), Washington, DC: Institute of Carmelite Studies, 1976 onward; and K. Kavanaugh & O. Rodriguez, The Collected Works of St. John of the Cross, ICS, 1979. See also the works of the anonymous 14th century British parson, The Cloud of Unknowing and Other Works (Clifton Wolters, Trans. ), Penguin, 1978. 4. Actually, the reader would do well to read the works of two influential Catholic mystic-contemplatives who were branded as Quietist heretics (unfairly, in my opinion): Michael Molinos (1628-96), The Spiritual Guide, and Madame Jeanne Guyon (1648-1717), whose works include The Autobiography of Madame Guyon, Spiritual Letters, Experiencing the Depths of Jesus Christ, etc., all available from Christian Books Publishing House (P.O. Box 3368, Auburn, ME 04210). 5. See John Ruusbroec: The Spiritual Espousals and Other Works (James Wiseman, Trans. ), Paulist, 1985, p. 265-7. 6. See Derwas J. Citty (Trans. ), The Letters of Saint Antony the Great, Fairacres, Oxford, UK: SLG Press / Convent of the Incarnation, 1975, Sections 3 & 4, pp. 11-12. 7. Thomas Keating, The Heart of the World, op. cit., pp. 2-3, 80.